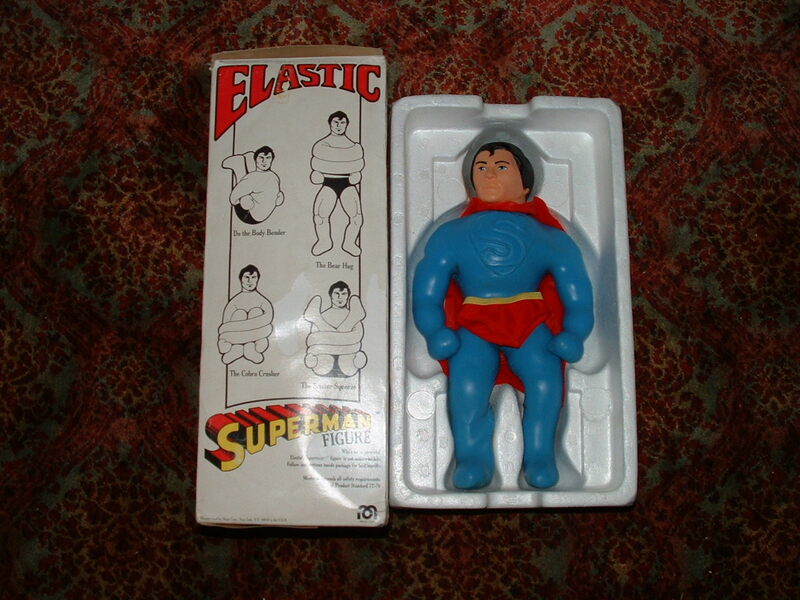 The Mego Elastic 8 consist of the only Mego Elastic Figures ever produced and now, almost 30 years later have become the rarest of not only stretch toys, but vintage toys in general. These 8 amazing elastic figures as a collection are so rare that there is only one confirmed person in the world right now that has all 8. The Mego Elastic, Spiderman,Batman,Superman,Hulk,Plasticman ,Donald Duck,Mickey Mouse and Casper are these 8.Collectors only recently are beginning to understand just how rare these action figures really are and how collectable they have become and will be in the future.Mego haulted production not only because of the Kenner Lawsuit, but also because of the products performance in the market place. The Elastics were incredibly stretchable for short term use but could not hold up to any long term stretching of only a few days or weeks.While their numbers are ever declining as any remaining elastics are simply tossed into the trash or poked and prodded creating instant holes and cracked limbs,only the very few remaining Elastics taken care of by their lucky owners will be around to see the next 30 years and will be worth a small fortune on the worldwide vintage toy collectors market, especially as a complete set.Here you will see the Mego 8 and learn just how these nearly extinced action figures together form a collection that is nearly impossible to attain. 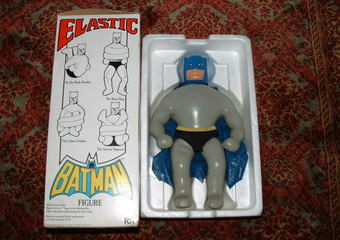 Only 2 confirmed Mego Elastic Batman exist in the world at the present time.Have you really thought about what that means? These Batman are virtually extinced and today are the prize of any Batman Collection and Stretch Collection. Incredibly the only two Batman left both have their blue capes still attatched.Being one of the hardest Elastic figures to attain, even when Batman is on the market for sale has become almost immpossible to own. Due to its extreme value ,the last Batman Auction was relisted because nobody could afford to hit its reserve and this is one stretch figure that will not be sold out of desperation. Now or later, Batman demands its price.Not many people can afford to pay what this figure is worth making it available to only a very small class of collectors. This Batman Figure can take up to a few months to a few years to find a buyer that can afford to pay its true value. The Batman Figure will be worth an undetermined amount in the next 5 to 25 years especially because it is one of the most popular Superheroes.Enough cannot be said about just how rare and valuable this figure is today. The Mego Elastic Plasticman is yet another testament to just how difficult it is to collect the Mego 8. Plasticman shown here is one of only two confirmed Plasticman left in existence. 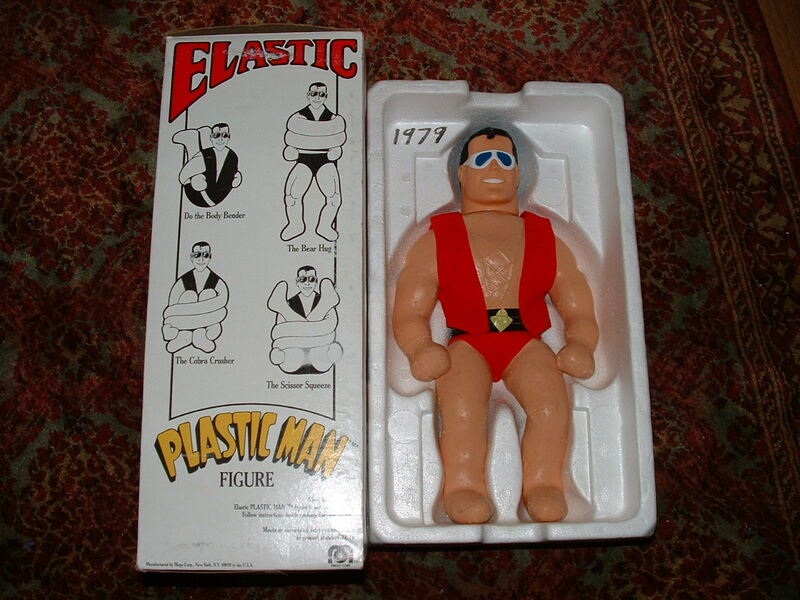 Plasticman being the final Elastic figure to be produced next to the Hulk was produced in such few quantities that it is likely you may never see another plasticman again. A former Mego Employee now almost 55 years of age said only a few hundred plasticman figures were released. That is such an incredibly low number which is another reason owning the Mego 8 Collection is a major miracle. 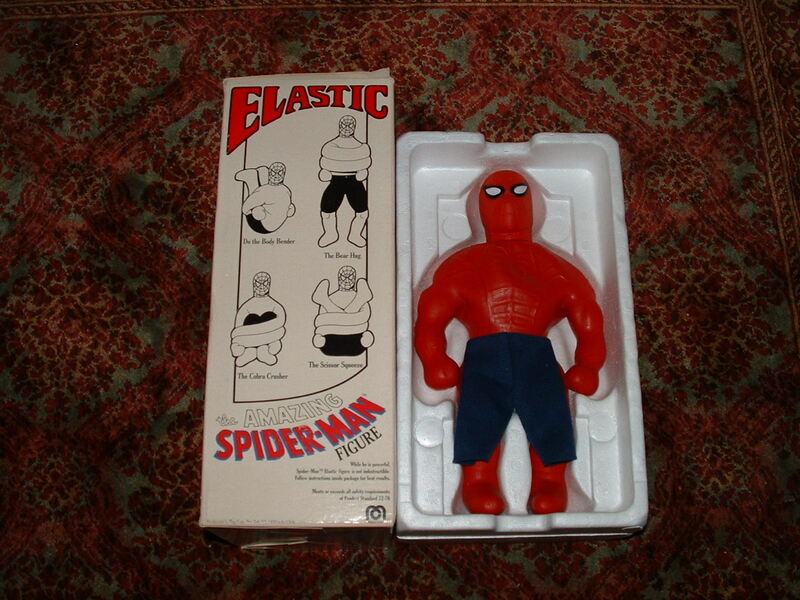 The Mego Elastic Spiderman in one of the more common of all the Elastics,however in recent years of the estimated 18 seen, most are in need of repair and are leaking and stuck in the box. The Spideys more than the other elatics seem to have more skin problems.One of the main reasons for this is that UV rays seem to break down the color Red more so than other colors. Can you remember walking into a Kaybee Toys or even a ToysRUs store and almost going blind when the bright lights hit you? I sure do. These MegoToy Stores used super bright flourecent lighting to light up all there super colorfull toys and promote and increase sales.Spiderman was also produced in a higher number so when the toy stores got them in stock,they needed to push sales so they would display their Spidey overload all over the store on end caps and points of purchase where they sat under these lights much longer than other elastics that were produced in fewer quantity. Elastics like Batman and Plasticman spent less time on the shelves under these damaging UV lights. So Spiderman even though stillmore common than the rest of the elastics is extremly scarce with only about 2 in top condition. 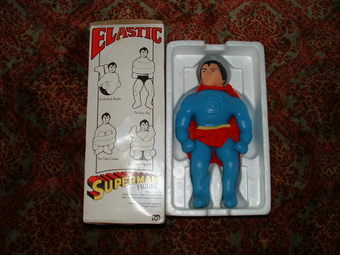 The Mego Elastic Superman although produced in a larger quantity over the other Elastics has become every bit as rare as the rest in recent years. Only a very small handfull of about 5 or 6 have been seen in over 7 years and only one close to mint box. Elastic Superman like the Batman has the plastic cape which again is an added plus if found untorn or even loose in the box.These capes detached very easily making this a very key factor in its value.Superman also came with a yellow "S" sticker on a peel card that was to be applied to the back of the cape. As you would think, this S sticker is unbelievably rare with only 2 known to date. So the Superman has some very neat added accessories which are very important to its value and are also very unlikely to be found making him a most immpossible find indeed ,especially in complete condition. 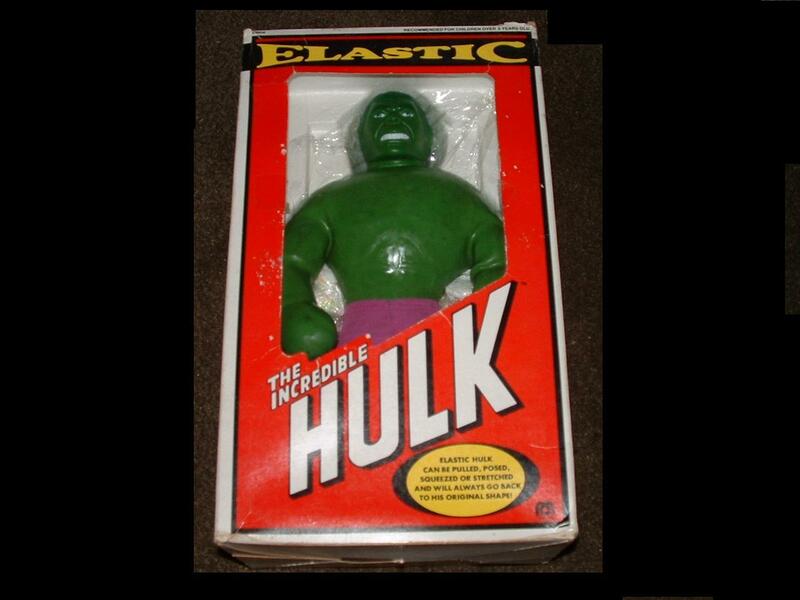 The Mego Elastic Incredible Hulk is the most desireable of all the Mego Elastics. There seems to be some kind of Raging Hulk Frrenzy when it comes to finding these rare Hulks. Another Elastic that one should be satisfied finding in any conditon. Of the curently 9 known Hulks, really only 6 of them are confirmed to exist, the other 3 exist in only the photos that were taken several years ago. It is impossible to confirm the existence of these 3 Hulks because the owners can no longer be reached.These 9 remaining Hulks exist in varying conditions from the number 1 mind blowing minty new Hulk to Hulks that have been refilled and repaired.All of these Hulks are incredibly valuable.Collectors are begining to understand just what "Only 9 left in the world "really means. 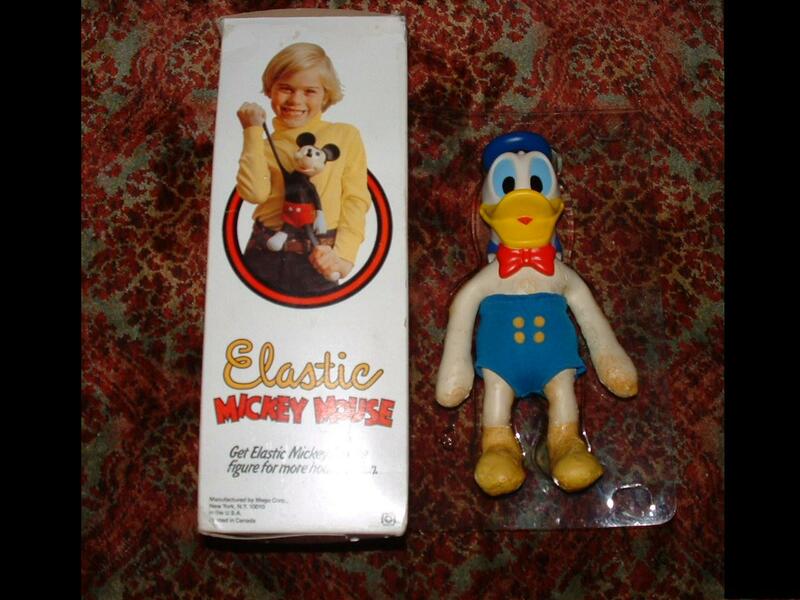 The Mego Elastic Donald Duck shown below has shown itself only 3 times in 7 years. All 3 Donalds have there problems with leaks and overall condition. Yet 2 of the 3 Donalds I personally repaired and preserved for many many years into the future and we must continue to do so with any others that may be found or there will surely someday be none left. 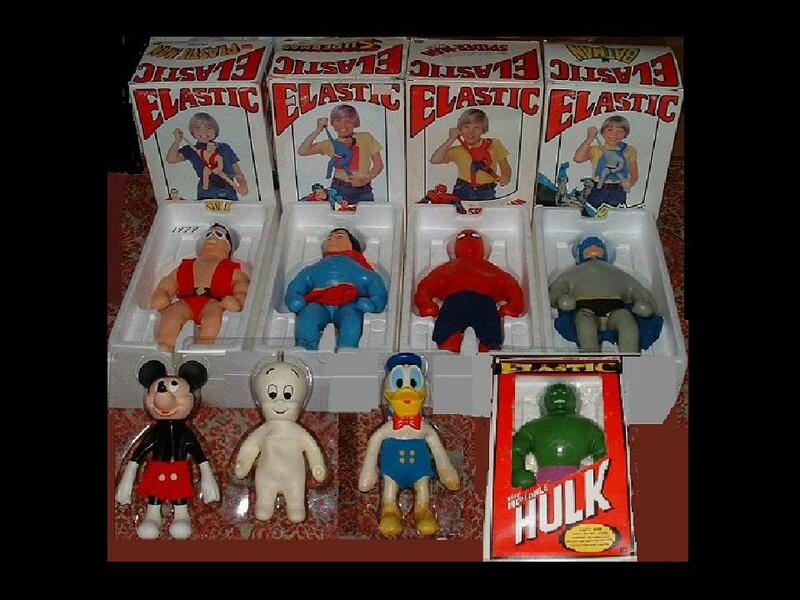 Donald was the more abundantly produced of the 3 Disney Elastics yet due to their thin arms and legs,most every one of them were simply ripped apart in a day or two of strteching leaving only a minute number left in the world today. Although it is very unlikely you will see any of the Mego Elastics anytime soon other than reslaes of the existing confirmed Elastics. I supppose One can always hope and dream. Finding any one of the elastic figures in any condition should make one happy and content. Remember, do not be fussy if you find another Donald or Elastic figure, it may be the only chance you will ever have to own one. 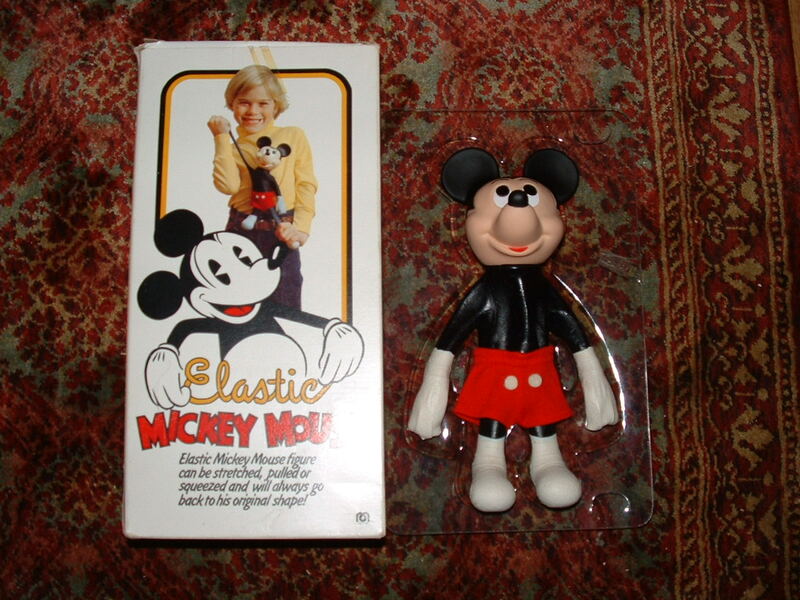 The Mego Elastic Mickey Mouse cannot possibly exist in any numbers larger than 5 to 15 at best. Produced to reach a much younger crowd of children between 6 and 8 years of age, The Mickey Mouse as well as the Casper and Donald Duck were definitley treated much worse than the larger Mego Elastics that were bought by kids at least 3 to 4 years older. Just think about what some little 6 year old kid would do with one of these things. Stretched, Bit, Stepped on, thrown in the sand box and the dirt,attacked with color markers or crayons, These Mickeys were doomed from the very start of their creation! These Elastics were just not made to hold up to that kind of abuse. So now, 30 years later we can see the rusults of such neglect and abuse by the incredibly scarce numbers that remain today. Only 4 Mickey Mice have been found to date and all 4 Mickey's have some degree of latex damage. Fortunatly, these 4 remaining Mickeys have been rescued by collectors that understand just what 4 left in the world means. 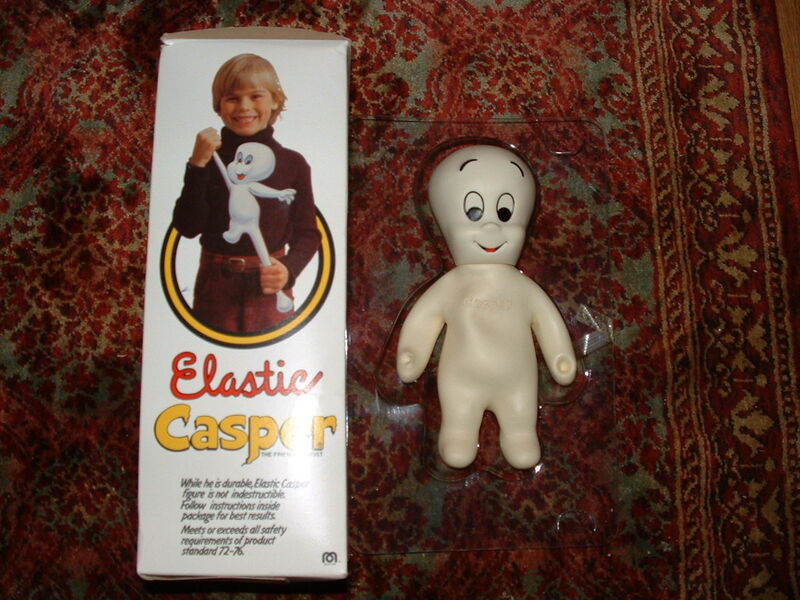 The Mego Elastic Casper shown below is in fact the only known Casper in existence today! There was one other alledged Casper being sold on a vintage toy website several years ago that ended up being a bogus sale. Mego Elastic Casper alone makes it so difficult to own this Mego 8 that the chances of finding a Casper are slim to none. Casper also was not produced in its planned numbers redering it all but extinced today. To a Casper collector, this figure would have to be one of the top toys in any collection. as it is a giant achievment in itself to find one in any condition. With its white skin, Casper is more likley to be found showing more dirt than other Elastics, however the good thing about the White color is that UV Rays do not absorb and damage as they do other colors making the chances of another Casper being found in decent condition a bit more likley. Mego Elastic Casper lives up to its ghostly name remaining almost invisable to collectors and will surly test your patience when trying to attain the Mego 8.